Corrosion is a common problem we're sure you’re all aware of. It can make vehicles extremely dangerous to drive and in some cases can cause a vehicle to fall apart while it’s being driven. Last year, a woman was killed when the car she was travelling in swerved out of control and into a parked vehicle after its rear axle fell off. 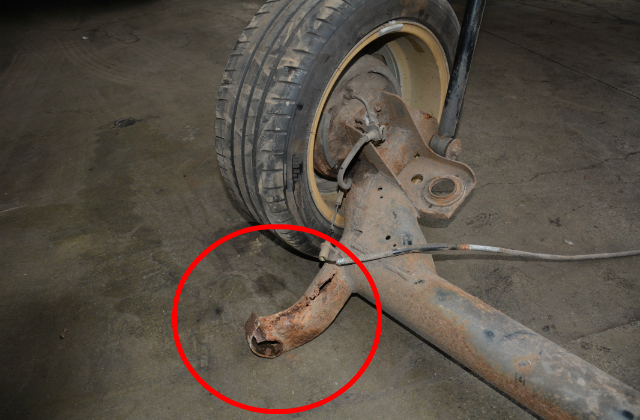 The picture above shows how badly corroded one of the axle's radius arms was when the car crashed. The other arm was just as bad. The corrosion on the radius arms may not have been detectable when the car had its last MOT. But if it was, and it had been detected, it might’ve saved her life. This really highlights the importance of checking for corrosion - particularly in older vehicles. Although this is an extreme example, it shows how deadly corrosion can be if it isn’t found. The location of the corrosion on the radius arm mounting would’ve made it very difficult to find. The tester would’ve needed to make an extra effort to get underneath the car and inspect the affected parts to find it. But, if they had, it could have potentially saved someone’s life. We know the majority of you always take the extra time to check the safety-critical parts of a vehicle for corrosion, but it’s not always easy to find. So, we’ve put together some tips to help you with this in the future. The first step is finding the corrosion. Sometimes, the corrosion is so obvious you can see it straight away. But, sometimes it isn’t. You should inspect the vehicle visually and use your fingers to inspect any parts you can’t see. If you find any corrosion, you should put pressure on it using your finger and thumb to see if it crumbles, or if the area feels weakened. If you need to, you can use a corrosion assessment tool to tap or scrape the affected area. Does the corrosion affect vehicle safety? If you find corrosion that seriously reduces the strength of a highly stressed component, you’ll need to fail the vehicle. If the corrosion isn’t in a prescribed area, you need to check whether any load bearing part is corroded enough to affect the braking or steering. If it isn’t, you should pass the vehicle and advise the customer what they should to do to fix the corroded part. If there’s been a repair to a damaged or corroded area, you should assess if the repair is suitable. Sometimes it can be difficult to assess the repair, especially if it’s been painted or undersealed. If you’re in any doubt, you should pass and advise. The work you do as MOT testers do is vital for keeping Britain’s roads safe. Our latest MOT Horror stories blog post is a great example of the types of things you’ve found and prevented potentially causing a dangerous accident. So, next time you’re testing a vehicle, go the extra mile to make sure it’s not dangerously corroded. It could make all the difference. Check out the MOT Inspection Manual for more information and guidance. Quote: "This really highlights the importance of checking for corrosion - particularly in older vehicles." Clearly this isn't a 40year old car but perhaps exempting older vehicles from Mot Testing is not such a good idea. ON THE SUBJECT OF MANUAL ADVISORIES, I hope you can add some for tyres;- I have seen the tyre sizes and fitting instructions GROUND OFF the sidewalls by second hand tyre dealers, Also sidewall repairs where I thought it was GENERAL PRACTICE not to repair, THIS IS SO COMMON, but it is not on any list ??? I Also Totally Agree John, we should have alot more Advisories available for tyre related issues if they are to remove our Manual advise option. On the subject of 40 year mot exemptions, I failed a 1967 Morris minor 4 months ago with almost 3 pages of corrosion defects the customers answer was that he had read about the 40 year exemption coming soon so he would wait till then to drive it on the road rather than repair it,these sorts of people do exist and they will drive a car till it falls to pieces or kills someone.bad move dvsa. Testing Advice would be useful for vehicles with known corrosion issues. I understand we should check everything but it is good to pay more attention to known problem areas. Some vehicles can be heavily corroded at a surprisingly young age. Two examples that come to mind are Citroën Xsara Picasso front sills and Nissan Navara chassis. In the later case many pickups have snapped dramatically. I believe Nissan have refused to recall all vehicles stating this is a maintenance issue rsther than saftey. This firmly passes responsibility to testers. we used to issue a Red hand written failure certificate for serious defects ie. brakes, steering and in those days the dreaded all to common corrosion found on 3+ year old vehicles. The failure certificate did not allow the vehicle to be used on a public highway until it was repaired to MOT standard. should they choose to drive it away from the testing station after the Mot test. What vehicle make and model did the offending 'rear axle' come from? There is often a pattern and I am sure all testers would appreciate this important information being made available. Did, as I strongly suspect, the corrosion originate from the inside of the tubular arms? If so, and assuming the component is an original fit from new, the manufacturer should take some responsibility as it is highly likely no cavity wax was applied internally at the production stage. As we all know there are some superior cavity waxes available and they certainly protect vulnerable enclosed and hidden areas over many many years. The vehicle was a 15 year old Ford Fiesta. So, next time you’re testing a vehicle, go the extra mile to make sure it’s not dangerously corroded. It could make all the difference." I find that statement slightly ironic, since DVSA are redoing the Manual, adding extra to the workload of Mot stations/testers, but not putting the price up of the Mot - WHY ? Your giving to the motorist with one hand and taking away with the other whilst giving Mot stations/testers more work with nothing extra in the pot ! Our MOT station only does MOT's and no repairs . we are extremely busy and have never advertised. we charge the full amount set by DVSA. Some people complain but they soon come back when the penny drops. Interesting reading! Corrosion, tyres, suspension, brakes all items that can become so dangerous to drive on the road could result in death , plus also how would we stand on our business insurance knowingly let a customer drive with a dangerous vehicle doing at wot ever speeds? Best to lend customer courtesy car until repair is undertaken. Who was it, that instructed the DVSA, in there news story about the MOT changes. To include the line. "The Maximum fees MOT centres can charge won't change." This implies, that as a motorists, your getting more for your money. Why as a Testing station, are we expected to do more for less? It was in 2016 that Neil Barlow made a statement on this site, stating, there will be a consultation on pricing, early in the new year. I personally would be embarrassed, if I had made that statement and still nothing had moved on, after all this time. When is the consultation going to take place? Eight years since the last increase in fees. It can not go on like this. At the time of writing Neil was correct that the Department for Transport was preparing for a consultation on this matter, but that has been deferred for a number of reasons. We do feedback the challenges that come from the trade around pricing. what happends when you are asked to do a mot pre check then tell the owner that it will fail on a lot and some dangerous he take it away and less than an hour later it has a full mot with no advisorys, so i have a look under and no work has been carried out so i ring dvsa my first point of contact. waste of time.nothing done. if a vehicle fails an mot on an item which is considerd dangerous it means that it should not be driven away from the testing station, it dosent mean that it cannot be driven . we dont have the authority to stop vehicle owners from driving their vehicles . all we can do is give them our best advice if they choose to ignore our advice then is nothing that we can do about it. however if the car is driven away against our advice then the legal responsability lay with the owner of the vehicle should any any repocusions ocur. The tester would’ve needed to make an extra effort to get underneath the car and inspect the affected parts to find it. The vehicle had its last MOT several months before the incident. We cannot be certain that the corrosion was detectable at that point as there's a possibility it may have rapidly worsened during that time. But if it was detectable when the vehicle was last MOT'd, the accident could have been prevented by an MOT tester finding the corrosion and failing the vehicle. Given the location of the corrosion, it would have been difficult to find and the tester would have needed to make a concerted effort to do so. This is a good post, even if it may have been created to divert us away from the previous post about the new manual, which is probably taking up a lot of Julia's time, I say this as a lot of my queries havn't been answered yet. Back to this post. It will remind a lot of testers about checking corrosion a bit deeper. So what I'd like to know is how will we advise some of this corrosion and painted over repairs, if the manual advisory is going to be removed? In my opinion the pictured corrosion has had no impact on the actual cause of failure. Yes it's corroded and yes should fail a test. However I have seen this before in my opinion someone has cut the beam along the Bush in order to replace bush and welded beam back together. People do this to avoid buying correct Bush pulling/fitting tools. But hey any monkey can work on a car!! where's the regulations?? if indeed a car is identified as being dangerous and cannot be driven away from the testing station how can this be enforced I cant see anyone listening I have had many ignorant customers that have had dangerous defects and despite being told DO NOT DRIVE THE CAR they do this very thing and away they go ??? Very good points. What about cars that are protected with plastic covers and visibility is impossible. For example Ferraris (not a great example) are virtually cocooned in plastic underside..
Good news about the power to keep a dangerous vehicle off the road, but where are we going to park it and for how long??? I always look for corrosion when im testing. Now after reading this article pause for a minute like i have and think about the ramifications that vehicles built before 1977 no longer require an mot. Absolute double standards,hope whoever dropped the ball on this subject sleeps easier than I do. Indeed very important to check for corrosion - but not required if was made more than 40 years ago! Old cars can corrode badly but really old ones from before 1978 are somehow not effected by corrosion!?. A short sighted, risky and ill informed decision taken by people who put more faith in statistics than common sense and who have never tested a vehicle. Shameful. Corrosion and inappropriate repairs are probably two of the most difficult items to identify objectively . Owners and repairers seem to be allowed to camouflage poor vehicle service and repairs with immunity. We are not allowed to insist that we see repairs before they are covered with copious amounts of sealer. We are only allowed to use finger and thumb pressure and our corrosion assessment tool. Much of the underside is covered with plastic which assists the unscrupulous. It's a real mission on some presented vehicles to identify all the faults accurately particularly if somebody is determined to hide dangerous defects. Remembering that the annual MOT is not a substitute for proper and appropriate maintenance by honest qualified professionals. It’s all very well saying it’s dangerous who says it’s dangerous it comes down to testers opinions brake discs our old favourite I would not let some go out on the road but pass and advise steps in the door. So to say it’s off the road more arguments with customers.dropped in it again. Department for Transport consulted on this and determined that such cars are more likely to be well maintained and used for shorter journeys. Motorists can still have an MOT carried out on their car if they want to. good posts-what was the vehicle involved? It was a 15 year old Ford Fiesta. I wanted to print this document to show to customers. I couldn't find how? Was it something I easily missed? - your printer should appear in a box on the left hand side of the screen from where you can print the article. The comments won't appear though. Chris, you say that if a defect is dangerous the vehicle will not be allowed to leave the MOT station. How are we intended to enforce this ? I can imagine some people not being at all happy with this and wanting to remove their vehicles regardless. In May the manual advisory will be no more, so advising that covers are obscuring some components that may be heavily corroded . "This really highlights the importance of checking for corrosion - particularly in older vehicles." Unless its over 40 years old and not been modified (sat in a barn/hedge for decades), in which case pump the tyres up and your good for the road. BL era vehicles are renowned for their imunity to corrosion so its perfectly safe. It will remain illegal to drive a vehicle in an unroadworthy condition and we recommend that drivers regularly get their vehicles serviced. Hi there,does anyone know what vehicle the axle came from? ?for future reference. The axle came from a 15 year old Ford Fiesta. Am I right in saying that in May cars over 40 years old will not require an MOT, surely this is a terrible idea. "This really highlights the importance of checking for corrosion - particularly in older vehicles.". So why then bring in a ruling to say that older vehicles will be MOT exempt? Crazy imo. Over the last few years corrosion on rear axles and front subframe/cross members seem to have gone worse . Corsas are prone but other vehicles also suffer from it . I have seen axles like this , and blame manufacturers for making poor quality parts . Has some old vehicles are still in good condition around these areas . Even later vehicles have suspension components showing surface corrosion not long after leaving the factory . This leading to more corrosion over the life of the vehicle. And this relates to all makes . I agree with this entirely. BUT, it is a total contradiction to the MOT exempt historic car rules. "It's important to check older vehicles", yet much older vehicles will go unchecked! We try to make our roads a safer place, not give the MOT dodgers a legitimate excuse. only guessing from the photo but it appears to be an old fiat or similar and(from memory)the section showing would have been inside a chassis mount with a triangular plastic trim above it,visibiltywould have been severely restricted,indeed your own post and comments give precisely that impression.instead of beating us over the head with something that you yourselves appear to believe was unlikely to be spotted in the first place try something constructive like letting the testing community know the make/model affected by this or similar problems,heres a few for instances for you,kia Sedona,nissan quashkai/juke,corsa c,suzuki alto and derivitives.you will have seen the Nissan crew cabs with the chassis that physicaly snaps in half in the tabloids yes?we as testers are yet to be informed of this being a problem or indeed its causes.provide us with this information at the start of a test and you never know,in your words IT COULD SAVE LIVES! The axle in the photo came from a 15 year old Ford Fiesta. theres a lot of cars out there with the same basic layout,ford ka,fiesta,assorted corsas,multiple fiats.all with the same basic h frame layout,its why I posted fiat or similar originally,they all mount the same basic way into a chassis or steel pressing box section that would largely obscure the area that appears to have failed,indeed the recommended test routine where we have to get the suspension hanging on the rear wherever possible would tend to hide it even better as the axle pivoted downwards.is this an endemic problem on these vehicles in which case we need informing or(as a for instance)had the rear beam bushes been torched or cut out for a prior replacement? ive read nearly all the replies about this 15year old fiesta but not once have you commented/replied about an issue raised, all you do is repeat its an axle off a 15year old fiesta. Your completely missing the point. with ref to Chris's reply that as from the 20th may 2018. What legal rights do we have to stop a vehicle being driven away from the testing station if it has had a failure issued including a dangerous defect. Can we only advise the driver of this ? Very good point to initiate will also pass on to fellow testers. remember, "The tester would’ve needed to make an extra effort to get underneath the car and inspect the affected parts to find it"
Failed a car on corrosion along with other items. Advised customer that plastic sills need to be removed to fully assess extent of welding required for quoting purposes. Customer takes to another garage and car passes with no advisories! Unless all test stations are working to the same standards we are all going to struggle to keep roads safe. Unfortunately some garages 'find' faults to fail cars which actually don't need it. However, I'd much rather a decent garage failed me so I'd keep safe than pass an unsafe car. I think you are correct - we need to work with DVSA to highlight the cowboys in our industry and raise standards to where they should be. Frustrating when you do your best to do a good job only to find others disregarding the manual and getting away with it. this happens to our test station quite often , then next day the car is passed elsewhere without any advisories. At our site inspection in December I raised the point with our area dvsa inspector , he stated that he simply didn't have the time to follow any reports like this up!! Agree. We see this so often and it's really frustrating when we're constantly trying to maintain and high standard of test. Similar to Nicks point, This is why it's so important to have a vehicle you are purchasing checked properly. There's many services out there that offer vehicle inspections before you buy. I go over many vehicles for people buying and some of the things I've found are horrendous but maybe not visable to the buyer or seller. pity this wasnt reflected in our wages ! Say for example corrosion was found and the vehicle was issued with a failure. Vehicle owner then drives the vehicle away and THEN has an accident ! Why not allow Testers or at least 1 person in every Testing station the power to issue prohibition notices on vehicles that really should not go back on the road ? From 20th May 2018, the MOT will change. Defects will be classed as dangerous, major and minor. If a vehicle defect is categorised as dangerous or major it will fail its MOT. Note: this has been amended to clarify the original comment. The MOT garage will have no authority to detain a vehicle. So what are we supposed to do with the dangerous fails ? And thats not going to go well with the public are we getting security details from home office or are the gov employing storage or recovery firms ? Thanks for reply, ref the "not allowed to be driven away" how will that work in real life ? Vehicle owner comes to collect vehicle, gets told it has a dangerous defect and they cannot drive it away - are we to refuse to hand over keys for the vehicle if owner decides they don't like that idea ? Regarding not allowed to drive vehicle away how do we as garages enforce this? I agree this decision should be available as I have myself had a couple of failures in the past that I told customer the vehicle was unsafe but could not legally prevent them from taking vehicle. I do hope that the general public are being informed that their vehicle cannot leave a testing station with a dangerous fail. can you please confirm that the public are being made aware of this or is it just going to be left up to us testers ? Not be allowed to be driven away, as in we have powers to retain car. Or as in car shouldnt be driven as we have marked it as dangerous? So the customer shouldnt by law drive an car in an unroad worthy condition? With regards to dangerous failures not being able to be driven away from the testing station, are we expected to prevent people removing their vehicles or to have cars abandoned on our premises until such time as they have it recovered ? this needs clarification. I cannot see in the draft manual where it says you cannot drive the vehicle away if it is failed with a dangerous defect. Who will enforce this, the mot tester the AE. How do we stop the owner from removing his vehicle. Unless you are giving us the power to seize the vehicle. Jim. Are we really going to have to stop vehicles from leaving the test station if they fail on a dangerous item and are you saying they have to be repaired on site or trailer-ed away . Does or will a test station have this power. I thought this had come up before and some one from DVSA said this is not going to happen. We can't stop them taking their vehicle off the premises so how will that work ? Hi how can you expect a tester to tell the customer they can’t get home after a test suppose it’s a single mum with no money or a six foot two gypsy who stores the car who pays for its removal and who gets the black eye you need to think this one again !! That's all well & good, but what powers do we have not to allow it to be driven away, at the moment if I issue a dangerous for a fail the customer can drive it away. I thought the only way you could stop that is by issuing a prohibition or will a dangerous now include a prohibition? What actual powers in law do we have to stop a vehicle being taken though? For example can I clamp a vehicle or refuse to give the presenter their keys back? Short of physically restraining the owner what can we actually do? I'm not sure how garages are going to stop them driving away. I was a DVSA vehicle examiner for 25 years and we had vehicles drive away from roadside checks with prohibitions on them. The wording is "should not be driven away from the test station",not "must not be driven away" big difference. How do we enforce this rule if people want to take their cars how do we actually stop them??? Hi Chris are saying from May we will have the power to stop people driving away from the VTS vehicles that have failed with dangerous defects ? Very interesting - where can i find the wording in the manual for not allowing the vehicle to be driven away if its classed as dangerous? I have read the draft manual and quite a few defects fall into the "dangerous" category - does this mean all these vehicles are illegal to drive away? Does this not involve a law change ? I was under the impression MOT stations couldn't stop vehicles being driven away - all we could do was to stress how dangerous it was and recommend not to drive. Is this changing? If so it needs explaining please! Where does it say a when failed on dangerous defects that the vehicle carnt be driven away? How can we enforce it? If a customer is intent on driving their car away, what can we do to stop them? Does this mean we will be able to stop customers from driving away from the test station if their car has failed and the defect is identified as being dangerous. I can see there being a lot of customers who will argue that we do not have the right to stop them driving away. Will we have some legal authority to stop them. "If a defect is identified as being dangerous, the vehicle will not be allowed to be driven away from the MOT testing station." Could DVSA please explain how, or even who, is going to stop a customer from driving away ? dangerous,major,& minor categoris are a good idea.R Bishop. Who will have the authority to prevent the presenter driving the vehicle away from the V T S? Sorry Chris but who is going to police this ? Why don't we have stickers like the NCT which they apply to a dangerous vehicle with a link to the police(garda). To make this mean anything it must be applied consistently, have teeth and have been publicised to the general public. I replied in another post before I saw this amended reply, a lot of testers were getting worried by this. Just interested why it was posted in the original we could retain a dangerous vehicle & then changed back to how its always been. Apologies for any confusion our original post may have caused. Once it became apparent it was causing confusion, we decided to clarify the position. Thanks for clearing that up about Mot stations not being able to retain customers vehicles issued with a Dangerous defect. My issue is....the Mot test is either about road safety or it isn't ! If it is....why are vehicle owners who have been told there vehicle is dangerous to drive, allowed to take there vehicles back onto the highway. I don't think this "dangerous" tagging has been thought through properly. Because unfortunately that would be a licence for garages to hold customers to ransom, if that ever came in it would be a sad day for motorists and a great day for garage Bank accounts !!!! Chris -So why is this not being made more prominent like in the MOT rule changes update (20-3-18) & who is going to stop the driver driving off ? As regards testers having the right to issue prohibitions - it will never happen. DVSA vehicle examiners have the powers under legislation issued directly from the Secretary of State, they have special training and another guide to comply with that dictates what sort of prohibition they can issue and then further guidance on removing the prohibition. As an MOT tester you can of course tick the box to denote anything as a dangerous fail or advisory item, this plus pointing out the dangerous item to the vehicle owner should be sufficient to leave you with no responsibility should the owner then drive the vehicle and have an accident. If necessary get someone to witness you issuing the paperwork to the vehicle presenter. I suggest you send this blog to every MP, so that they might reverse the crazy decision to exempt vehicles over 40 years old from mandatory testing. It would also help if the test fee had been increased in line with inflation, a competent tester should be properly paid for the necessary time spend to thoroughly inspect a vehicle. particularly in older vehicles you wrote, shame they will be exempt after May 20th.